Are you tired of paying high electric bills? I know I am! I have heard of all the different energy saving light bulbs and have tried a few. The swirly little florescent bulbs are ok but leave a little to be desired as far as the brightness of the light they give off. So when I heard about Sunlite Daylight Bulbs I was excited to give them a try. These are 60 watt bulbs that consume 10 watts of electricity, saving money from the start. Now factor in their life span. They have a life span of 18.26 years. WOW!! Saving money not only on my electric bill but now I don't have to buy bulbs for a LONG time. Win / win!! The outer part of the bulb is plastic so no shattering if dropped like incandescent bulbs. Which brings in the next product I want to tell you about. I was given opportunity to try out Makeup Brushes. This is a really nice set of makeup brushes. There are 10 brushes in the set. 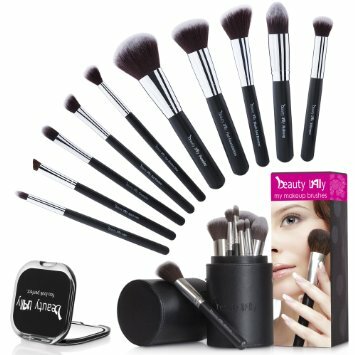 There is a makeup brush for applying liquid and cream foundations. A Flat foundation brush for buff foundation with high definition with liquid or cream. A concealer brush to cover any blemishes, sunspots, or under eye circles. A powder brush for loose powder, just tap off excess before using a sweeping motion to brush it on. A blush and bronzer brush, this is a soft, full brush. Shimmer brush, lightly sweep the brush over your cheeks them move to your chin and nose area to give your skin a glow. The eye shadow brush, apply a single color to the eyelid as a base or highlight. Eye shadow blur brush is used to blend eye colors and highlight the brow bone. The eyebrow brush is used to fill in brows with powder or gel. The lip brush is for filling in lips with expert precision. The makeup brushes come in a nice black designer case, and there's also a compact makeup mirror included. This is a really nice makeup brush set.